Some dental practices focus on treating patients of certain ages or with specific dental needs. At Morgan-Hill Dental Care, however, we offer high-quality general dentistry to patients of all ages and backgrounds. You can rely on our talented team to care for everyone in your family, from your youngest children to your loved ones who have already reached their golden years. You won’t have to run all over town when it is time for everyone in your family to have a routine cleaning and exam. Plus, you won’t have to keep track of multiple practice’s payment policies. An inviting atmosphere. Our friendly staff knows how to make patients of all ages and backgrounds feel welcome and safe. Learning experience for children. When kids see Mom and Dad visiting the same dentist as them, they’re likely to be less fearful when their own turn in the big chair comes. Family-focused care. It’s common for multiple family members to experience similar dental problems, either due to genetics or shared habits. We can address those problems and help everyone in your household work together to achieve healthier smiles. Preventive care. Visit us for your twice-yearly cleanings and checkups. 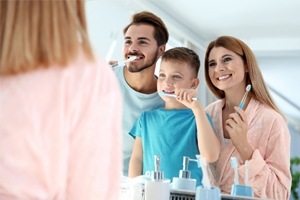 We’ll coach your family on oral healthcare at home and recommend further services to help you maintain happy, strong smiles. For example, we might suggest that children receive dental sealants or a fluoride treatment. Emergency care. Accidents happen, and toothaches can pop up any time. If you or anyone in your family experiences a dental emergency, call us right away. We’re usually able to see emergency patients on a same-day basis. Sedation dentistry. We understand that some folks are a little (or very) nervous when it is time to visit the dentist. We offer nitrous oxide sedation, which is safe for both children and adults. We can also provide more powerful oral conscious sedation. Restorative dentistry. If you or anyone in your family needs a filling, crown, or other restorative treatment, we’re happy to design a treatment plan that will get you on the road to regaining a fully functional smile. Are you ready to learn more about how our team can serve as your family dentist in Gorham? Contact us today to schedule an appointment or ask questions about our practice.